Why has Thomas Pikkety’s academically-inclined Capital in the Twenty-First Century become one of the top books of 2014? It was the right book at the right time. “There’s been a bizarre phenomenon this year: a young, little-known French economist has written a 700-page tome about economic inequality – dense with data, historical examples from France, and a few literary references to Jane Austen. That’s not the strange part. This is: it’s a bestseller. The book, of course, is Thomas Pikkety’s Capital in the Twenty-First Century (Harvard University Press), which argues that the fact that invested capital (in the stock market let’s say, or in the stock market) grows faster than income, has become, according to Lewis, “a conversation piece among well-read people.” But she also notes that the themes that Piketty raises have been part of the discussion among progressive economists for decades. So then, why did this book strike such a chord among readers? Lewis spoke to several economists and financial experts to get their take. Stephanie Kelton is chair of the Department of Economics at the University of Missouri-Kansas City. She is also editor-in-chief of the top-ranked blog New Economic Perspectives. “What explains the Piketty phenomenon? The book, which has sold more hardcopies than its e-book alternative, commands so much real estate that it will crowd out a few old favorites when it takes a stand on your shelf. The title, Capital in the Twenty-First Century, doesn’t exactly carry the titillating allure of a bestseller like, say, Fifty Shades of Grey. It looks and sounds like what it is – a scholarly tome that sets out to investigate changing patterns of ownership in the economy’s most dominant resource, capital. Who owns the world’s stock of tangible and financial assets, where did they get them, and how did the distribution of ownership change through time? …My own guess is that Capital was the right book at the right time. 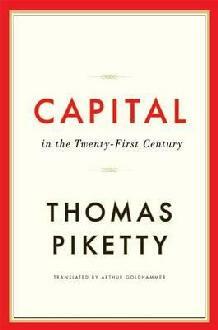 “I like Thomas Piketty’s Capital in the Twenty-First Century a lot. It follows Larry Summers’s advice – which I have always thought wise – that the further ahead in time we want to forecast, the further back in time we should look. It deals with very big and important questions. It takes a broad moral-philosophical view, rather than a narrow technical-economist view. It combines history, quantitative estimation, social science theory, and a deep concern with societal welfare in a way that is too rare these days. But I thought it would be a book for a narrow audience: me and a few others. I expected people who did not have the souls of accountants to start to snore at Piketty’s numbers, numbers, numbers and more numbers. What we can think about is why the soil was fertile: why was there the potential for a mass-audience viral explosion of interest in Capital in the Twenty-First Century rather than our standard set of viral propagation memes – cat videos and Buzzfeed’s Twenty-Seven Things You Won’t Regret When You Are Older? I confess that I do not know. I do have a guess. My guess is that the book-buying upper-middle class of America today is greatly distressed when it looks at the world around it, specifically at two things. The first is that our society today is largely failing its non-migrant non-college-completing majority, in that for all of our cheap electronic toys, life is no easier than it was a generation ago in spite of an enormous explosion of technology and productivity. The second is that they now know of a plutocracy that did not previously exist and makes us very uneasy. Last generation’s Michigan governor and American Motors president George Romney lived in a large-but-not-abnormal house and bossed a company that created lots of good jobs at good wages. This generation’s Massachusetts governor and Bain Capital CEO Mitt Romney has seven houses worth perhaps $25m in total, and bossed a company whose core business model appears to have been exploiting legal anomalies, like the fact that pension funds have little control over their money after it’s invested. To read the rest of the article, including commentary from Tyler Cowen and Emmanuel Derman, click here.